After the catastrophic trifecta of the triple meltdowns at the Fukushima Daiichi nuclear complex in Japan last March—what the Japanese are referring to as their 3/11—you would think the Japanese government would be doing everything in its power to contain the disaster. You would be wrong—dead wrong. Instead of collecting, isolating, and guarding the millions of tons of radioactive rubble that resulted from the chain reaction of the 9.0 earthquake, the subsequent 45- to 50-foot wall of water that swamped the plant and disabled the cooling systems for the reactors, and the ensuing meltdowns, Japanese Environment Minister Goshi Hosono says that the entire country must share Fukushima’s plight by accepting debris from the disaster. The tsunami left an estimated 20 million tons of wreckage on the land, much of which—now ten months after the start of the disaster—is festering in stinking piles throughout the stricken region. (Up to 20 million more tons of rubble from the disaster—estimated to cover an area approximately the size of California—is also circulating in the Pacific.) The enormous volume of waste is much more than the disaster areas can handle. So, in an apparent attempt to return this region to some semblance of normal life, the plan is to spread out the waste to as many communities across the country as will take it. At the end of September, Tokyo signed an agreement to accept 500,000 metric tons of rubble from Iwate Prefecture, one of eight prefectures designated for cleanup under a new nuclear decontamination law passed on January 1. The law allows for much of the radioactively contaminated rubble to be incinerated, a practice that has been underway at least since the end of June. But the sheer amount of radioactive rubble is proving difficult to process. The municipal government of Kashiwa, in Chiba Prefecture to the west and south of Tokyo, recently shut down one of its main incinerators, because it can’t store any more than the 200 metric tons of radioactive ash it already has that is too contaminated to bury in a landfill. According to the California-based Fukushima Fallout Awareness Network (FFAN), burning Fukushima’s radioactive rubble is the worst possible way to deal with the problem. That’s because incinerating it releases much more radioactivity into the air, not only magnifying the contamination all over Japan but also sending it up into the jet stream. Once in the jet stream, the radioactive particles travel across the Northern Hemisphere, coming back down to earth with rain, snow, or other precipitation. Five days after the Fukushima meltdowns began, radioactive fallout from the disaster reached the West Coast of the United States. 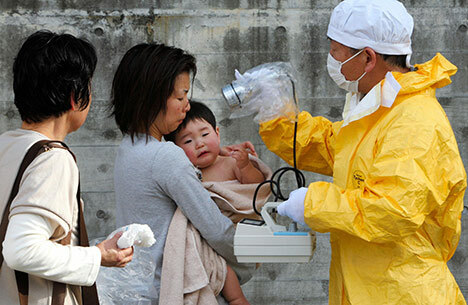 Approximately a week later, Fukushima fallout was measured as far away as France. In October, the journal Nature reported that the Japanese government’s initial estimates of radiation from Fukushima were substantially less than what Scandinavian researchers calculated from a global network of radiation monitoring stations that the Vienna-based Comprehensive Nuclear-Test-Ban Treaty Organization uses to detect nuclear weapons tests. A great help to nuclear proponents is the fact that nuclear physics is complicated, and most people don’t understand even its most basic concepts. The blanket term “radiation” is used to describe all manner of radioactive contamination—as if it’s just one thing—when, in fact, there are different kinds, some much more damaging than others. It also matters exactly what is being exposed to radiation—i.e., exposure outside the body or inside it—and how long the exposure goes on. This process is known as the “decay chain,” and during their decay, most radioactive elements morph into yet other radioactive elements on their journey to becoming lighter, stable atoms at the end of the chain. Some of the morphed-into elements are much more dangerous than the original radioisotope, and the decay chain can take a very long time. This is the reason that radioactive contamination can last so long. To further complicate the issue, different radioisotopes give off different kinds of radiation—alpha, beta, gamma, X ray, or neutron emissions—all of which behave differently. Alpha emitters, such as plutonium and radon, are intensely ionizing but don’t penetrate very far and generally can’t get through the dead layers of cells covering skin. But when they are inhaled from the air or ingested from radiation-contaminated food or water, they emit high-energy particles that can do serious damage to the cells of sensitive internal soft tissues and organs. The lighter, faster-moving beta particles can penetrate far more deeply than alpha particles, though sheets of metal and heavy clothing can block them. Beta particles are also very dangerous when inhaled or ingested. Strontium-90 and tritium, a radioactive form of hydrogen, are both beta emitters. Gamma radiation is a form of electromagnetic energy like X rays, and it passes through clothing and skin straight into the body. A one-inch shield of either lead or iron, or eight inches of concrete are needed to stop gamma rays, examples of which include cobalt-60 and cesium-137—one of the radionuclides of most concern in the Fukushima fallout. Aside from use in medical diagnostics, X rays are also produced in nuclear fission, and their effects are similar to gamma radiation. Neutron emissions are the most penetrating of all types of radiation and require a shield of several feet of water or concrete to contain them. The behavior of radioisotopes out in the environment also varies depending on what they encounter. They can combine with one another or with stable chemicals to form molecules that may or may not dissolve in water. They can combine with solids, liquids, or gases at ordinary temperature and pressure. They may be able to enter into biochemical reactions, or they may be biologically inert. Specific health effects from internal radiation exposure correlate with where radioisotopes land in the body. Bertell explains: “For example, radionuclides lodged in the bones can damage bone marrow and cause bone cancers or leukemia, while radionuclides lodged in the lungs can cause respiratory diseases. Generalized whole body exposure to radiation can be expressed as a stress related to a person’s hereditary medical weakness. Individual breakdown usually occurs at our weakest point.” In other words, the impact of radiation exposure also depends very much on each individual’s level of health and genetic make-up. Fetuses in utero, infants, and young children—all of whom have quickly dividing cells—as well as the elderly and people with compromised immune systems are most vulnerable to radiation exposure. “Official” sources like the Environmental Protection Agency and the UC Berkeley Nuclear Engineering Air Monitoring Station consistently downplay the health effects of the fallout. In fact, the EPA was so confident that Fukushima fallout would not be a problem for U.S. citizens that it stopped its specific monitoring of fallout from Fukushima less than two months after the meltdowns began. But neglecting to monitor the fallout will not make it go away. In fact, another enormous problem with radioactive contamination is that it bioaccumulates in the environment, which means it concentrates as it moves up the food chain. (Think of mercury in fish.) Because many radionuclides are so long-lived, this can be a problem for a very long time. For example, the U.K. is only now considering lifting restrictions on the remaining 334 sheep farms in Wales that are still prohibited from selling any meat because of contamination from the Chernobyl disaster in April 1986. In this video, FFAN member Kimberly Roberson points out that the first disaster at Fukushima Daiichi following the earthquake and tsunami was accidental: “However, by burning the millions of tons of radioactive rubble, it’s going to provide a brand new humanitarian crisis.” She observes that this crisis—“transgenerational DNA damage that’s passed well into the future”—is additional and intentional, and that everything possible must be done to stop it. Roberson’s point is well taken. However, the desperate yearning among the Japanese to get past this disaster combined with the uncharted territory of dealing with a triple-whammy catastrophe of this magnitude—earthquake, tsunami, and three nuclear meltdowns—seems to be clouding their vision. The truth is, a nuclear disaster offers no easy or good choices. But some, like vaporizing the radionuclides throughout the atmosphere, will unnecessarily prolong the danger to the people and environment of Japan and spread the pain far and wide.